Quantum dots are assemblies of colloidal semiconductor crystals which have properties colluded with light, and have found use in fields as diverse as biological sensing, imaging, LED displays and solar energy harvesting. They have great potential, they have to date been difficult to produce in bulk. 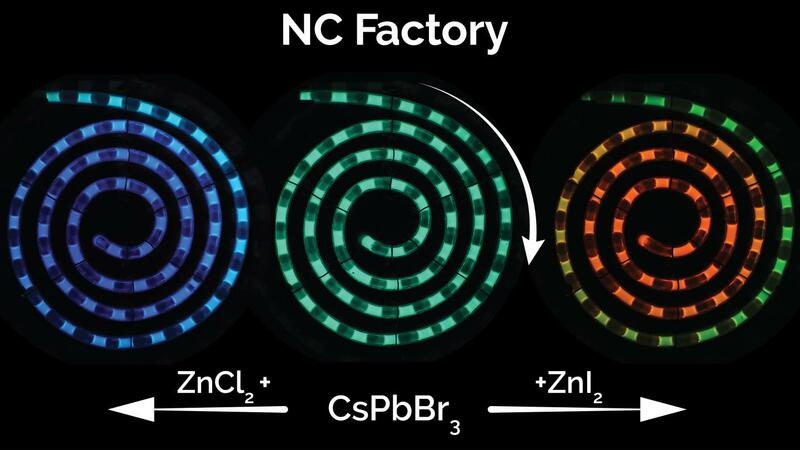 Engineers at North Carolina State University claim that their new technique, which allows real-time process control to ensure quality, could solve this problem. The NanoRobo system was unveiled in 2017. At the time, Abolhasani explained that the system got around major drawback with producing nanocrystalline structures by chemical synthesis: the physics are unfavourable to scale up. NanoRobo incorporates a microfluidic channel along which a spectrograph monitoring module can move, collecting both fluorescence data, which shows what colour of light the crystal emits, and absorption data, which shows the crystal’s size and concentration and which wavelengths it absorbs, relevant for solar cell applications. This allows much faster collection of data, which in turn speeds up the discovery, screening and optimisation of semiconductor nanocrystals. The process starts with caesium lead bromide quantum dots, which emits green light, and then replaces the bromine atoms with iodine, which moves the fluorescence towards the red end of the spectrum, or chlorine, which shifts it towards the blue end. It does this by mixing the quantum dots with the correct proportion of halide salts in solution. The NC Factory consists of three “plug and play” modules: a pre-mixer to speed up the mixing of halide salts and quantum dots, in order to improve quality; a velocity sensor to monitor reaction times accurately, and the NanoRobo module to monitor the process. In particular, the technique reduces the cost of manufacturing perovskite quantum dots, which is currently a part of their exploitation. More than 60% of the cost of the quantum dots is related to their manufacture. “The NC Factory system would require far less labour to operate continuously,” Abolhasani said. “We estimate that the system could cut overall manufacturing costs by at least 50 percent. It should reduce manufacturing costs of QDs for any application and should at least preserve – if not improve – the quality of the quantum dots.